I have always loved playing through Artus Topside in singleplayer. It is just before Kyle regains his powers, and the first time you face off against AT-ST's and confront Desann. Sadly, most conversions of this map for multiplayer tend to skip over many of the smaller details, which are often the things that make these SP maps feel more alive, such as sounds, ambient noise, among other things. I wanted to create a version of this map, where most of the things that were functional in singleplayer would also work in multiplayer, rather than to just remove them. Looking back at my first attempt at this map I was honestly not at all satisfied, and decided it was time to revisit the map and give it some extra love and care which in my opinion has paid off. In this latest update to the map, most of the features it contains have been entirely reworked from scratch, including the behaviour of the lifts, and the way the electric rings surrounding the now broken ion cannons behave, to bring them even closer to their singleplayer counterparts. As of this moment I have yet to see another conversion of this map with as many of the details replicated as there are in mine, which is something I take great pride in, and hope you guys will appreciate equally as much as I do. As with the other conversions, the goal was to make it closer to its SP counterpart, as well as to provide support for more gametypes, while of course keeping the FPS as optimal as possible. This in part mean that I made a choice to not include the spray of blaster fire in the sky from various ships, and chose to not have Tie-fighters and X-wings flying across the sky, or to have any Tie crash from time to time, as these things could contribute to FPS loss, even if only a bit. There will still fall a meteor every once in a while, but that's the only thing from the sky that I chose to keep in this conversion. 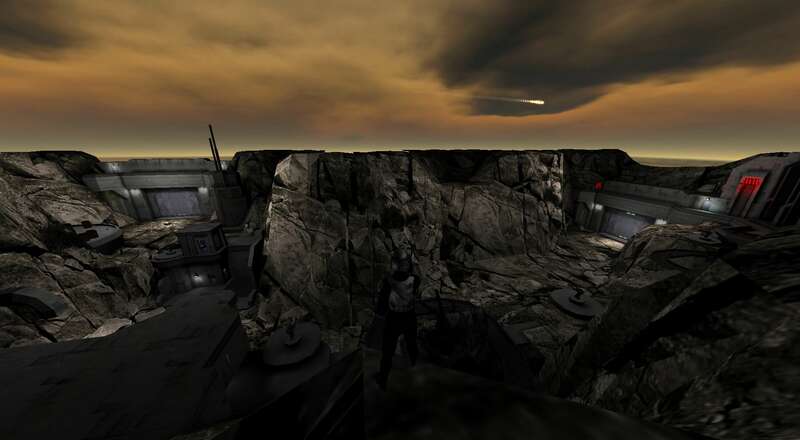 Most singleplayer features of the map are functional, including the electric rings surrounding the broken ion cannons, and all of the lifts behave as close to their SP counterparts as were possible for MP. Sound effects and ambient noise matched to those found in the SP version. Ysalimari teleport to a hidden room on the map. In case anyone either doesn't want to have the emplaced gun turrets on the map, or have any other issues with them (such as an alloc error), I have included a version of the map without them as well, which can be found in its own folder. I personally don't have any issues with them, and feel the map is lacking something without them, but I felt like it should be an option to not have them, for one reason or another. If you want to make use of the version with the emplaced turrets, and isn't exactly fond of the yellow alloc error, consider giving the following file a look. It contains many missing models, which Raven Software released as developer resources for mappers, examples of which being the emplaced turret, Reelo's chair, among other models, which you can add to your base folder, server ref_forcelist, etc. Please note that for the server to recognize the missing models pk3 as active on e.g. Artus Topside, it seems like you must reference the pk3 in the ref_forcelist, as without doing so people would not load the pk3, and thus the yellow error would still occur to them. To install this, simply make a folder called maps in your server directory, and then unpack the bsp file in there. No need to add it to a downloadable pk3, as it is a serverside map edit. Should you for some reason want to have it installed in the base folder, then it might be required to put it inside a pk3 however, as it may otherwise be loaded before the vanilla Artus Topside, but I generally advice to keep serverside edits in a folder inside of your server directory if possible, as there's no reason for people to download the map. Last edited by Kevin on 19 Oct 2018, 12:12, edited 6 times in total. I love the fact that you took your time to make a version without the missing models for those who doesn't have the model pack, thanks for your awesome work. I'm also thinking about how this map could work pretty nice as a fast-paced CTF map. There is even colors! Blue base to the left and red base to the right. Where would the flags be located then? Flags behind the gates, weapons inside the buildings to make it worth to take the time to go back there, blue has the advantage of high ground, but red has the advantage of 2 placed guns and more inside room for weapons, where blue need to go to the middle gate to take guns. OMG, I think I'm going to host a guns only server to see how this works. Updated the map. Read "Update notes" for more information.